When it comes to travelling in different parts of the world most of us pledge ourselves to eat the countries best delicacies. 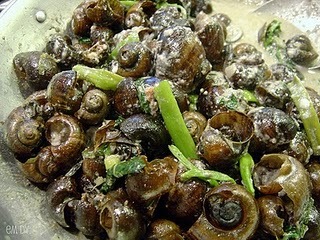 However, there are some people who are fond of eating unusual delicacies known as the exotic foods. They find it thrilling and exciting to taste the weirdest food in this planet. Although some exotic foods may not be good to your health, there are countries where eating these unusual delicacies have already been part of their tradition and culture. Some people found it strange and weird to eat an exotic food but for some its part of their leisure and adventure. The unusual dishes may not be too good to our sense of sight, smell, touch and taste but those who love to eat strange food find pleasure and satisfaction. Tuna eyes - These are the fatty, jelly like eye balls of tuna and very famous in Japan. It is prepared by steaming with soy sauce and garlic. Some choose to eat the tuna eyes raw. Pandang foods – A delicacy from Indonesia made of beef, lungs and fish head served in curry sauce or in a very spicy chilli sauce. Lamb brain – A famous exotic food in India. It is cooked in curry or fried with egg, tomatoes and masala. Balut – This is half fertilized native chicken or duck egg cooked in boiling water. It tastes good with spicy vinegar. This is a very famous food in the Philippines. White ant egg – A very famous exotic food in Thailand. The soft eggs from ants or termites is used as main ingredient in a soup. You can see it in food stalls along the streets where they also sell fried frogs, grasshopper, beetles and scorpions. Fugu – Blow fish or Fugu is a famous delicacy in Japan which is very rare because it contains a high tetrodotoxin that can make a person paralyzed and killed in an hour. A person must be licensed to cook this kind of food. It is slightly or thinly sliced like sashimi and served with wasabi. 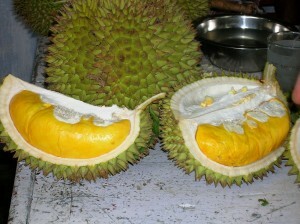 Durian – Also known as the King of fruits because of the powerful scent which you can smell even miles away. The exotic fruit is found in the Philippines, Thailand, Singapore, Malaysia and Vietnam. The fruit has spikes on its skin and tastes good despite of the scent. Beondegi – Silkworm pupae is one of the famous exotic snacks in South Korea. It is either boiled or fried and combined with tasteful seasoning. It is very crunchy and tasty when fried.